The rag-tag fleet discovers the planet Kobol, the lost homeworld of humanity. Read the complete synopsis of "Lost Planet of the Gods" Part 2 at the Battlestar Wiki site. I borrowed the title of issue #5 of the BSG comic book by Marvel Comics for the title of part 2 of "Lost Planet of the Gods". As their journey through the void is underway, Omega conveys damage reports from the Rising Star and Edena. Possibly the Edena is the same ship that appears as a socialator ship, the Adena, in the novel Armageddon. Apparently one of the religious books Adama puts great faith in is called the Book of the Word. In the previous episode ("Into the Void") we learned that Athena is now Starbuck's wingman. Here, we learn that Serina is Apollo's wingman. Is the Colonial military in the habit of pairing lovers in their viper squadrons?? One of the great scenes of Battlestar Galactica I've remembered ever since I was a kid, is Starbuck striking a match for his cigar on the chest of a Cylon centurion after being taken prisoner aboard Baltar's base ship. The Colonials generally use the term "sealed" for marriage. This term was derived from the Mormon Church, of which BSG creator Glen A. Larson is a member. Adama seems to acknowledge there are many faiths derived from the history of Kobol when he says, presiding over Apollo and Serina's wedding, "...under the eyes of God, bound by the symbol of the faiths of the Lord of Kobol, I declare you sealed." When the fleet comes upon the lone star in the void, Adama orders a scan to search for a planet 1-3 parsecs from the star. In the real world, a parsec is 3.26 light years of distance, i.e. the distance light travels in 3.26 years! However, the BSG Writer's Guide defines a parsec differently, just 90 million miles (which is the average distance of the Earth from the Sun). The Writer's Guide also states that a parsec is the equivalent of 10 hectars in Colonial parlance. The shot of one of the fleet ships approaching Kobol at 18:21 on the DVD, is reused footage of the mining ship approaching Carillon in "Exodus". 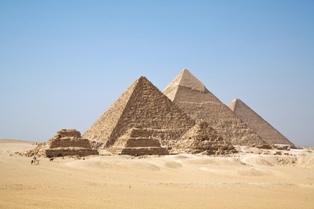 The outdoor shots of the Kobolian ruins and pyramids were shot at the Giza Necropolis in Egypt. Adama says that Eden was the largest city on Kobol and the first to fall. But fall to what? Why? Adama tells Apollo and Serina that the Ninth Lord of Kobol was the last Lord of Kobol before the migration. Although we don't see the turn on screen, it's obvious from before and after shots (at around 22:59 on the DVD), that the indented symbol on wall of the Ninth Lord of Kobol turns horizontally after Adama places his matching medallion within it. The electronic torches (working yet!) found inside the tomb, suggest a level of technological sophistication in the former civilization not necessarily evidenced by the ruins on Kobol. Shouldn't there have been an empty slot in the torch holders when Adama, Apollo and Serina come upon it, considering we shortly learn that Baltar beat them to the tomb and is carrying an identical torch? Baltar remarks that he was a member of the Council of Twelve back in the Colonies and that he lost his family in the attack. All indications throughout the stories of BSG seem to indicate that he was unmarried and had no children. To what family does refer? Parents? Siblings? "There Will Be Blood" later reveals that Baltar's father is already dead by this point; his mother is not mentioned. When Adama confronts him about his role in the destruction of the Colonies, Baltar claims he was a victim as well, trapped during the Cylon attack between the President's battlestar (the Atlantia) and his own. What was Baltar's battlestar? When he says "his" does he mean he was in command of it? Or just that he was assigned to one (or it to him)? It's hard to imagine the Colonial military giving Baltar command of a flagship of the fleet. Adama says that Baltar has the soul of a serpent. This may be an allusion to having the soul of a Cylon as well since the original Cylons were reptilian. Adama reveals to Baltar that he is planning to lead the fleet to Earth to make a new home. Was it wise to give this information to the biggest traitor in human history? Lucifer seems to suggest that he could have been the Imperious Leader after the destruction of the previous one at Carillon. The current Leader was part of the same series as Lucifer, the IL series. It's left unexplained whether Kobol and its star exist in the midst of the void or if they've exited the void when they arrive. That is, it's never stated that they've exited the void, yet we see background stars during the Cylon attack on Kobol, indicating the planet is outside the void. However, the Marvel Comics stories that begin immediately after this episode depict the fleet as journeying through the void for quite some time more before exiting it. If Kobol does lie within the void, was it always this way? If so, is there some significance in the fact of the human life form having originated on a world that existed in the void and not in the normal galaxy of stars? In fact, the star of Kobol is a confusing issue in itself in that the scriptures claim that the twelve tribes that fled Kobol were led out of the void by the sudden appearance of a star, and the fleet was led to Kobol by the sudden appearance of a star, in this case, the star of Kobol. They can't both be the same! The Kobolians would be pretty stupid if they didn't know their own star. How was the void created? We learn in this episode that the star of Kobol is pulsing and, presumably, dying. Is it possible that the void was once a normal stretch of space, full of stars...but that something in the region has gradually caused the stars to flicker and fade at an accelerated rate, one-by-one, as Kobol's sun has been doing for several thousand years? Baltar tells Adama, "You could drift forever in search of what? A planet that may be the myth of half-drunken star voyagers who came back to die here?" This suggests that the Kobolian mythology may have references to individuals who returned to the planet from Earth to tell of it. How else would the 12 Colonies know of the alleged fate of the 13th tribe and its settlement of Earth unless some came back (or communicated over the vast distance) to tell of it? And this brings up the possibility that the so-called 13th tribe may have been the first tribe to leave Kobol; maybe they suspected the decline of Kobol's sun before the rest of the world was willing accept it, left, discovered and colonized Earth and allowed a few members to return to tell of it. Although, if that were the case, why would the 12 remaining tribes not head to Earth themselves once the danger to Kobol became clear? Maybe they intended to but became lost in the void, came out in the opposite direction, and found the 12 worlds that became the Colonies instead. At 33:54 on the DVD, Adama's medallion of the Ninth Lord of Kobol has a significantly larger diamond shape in the middle than it did in previous scenes! The scene of destruction at 35:55 on the DVD is simply the same as the one at 34:30 inverted! You'd think the first thing the Cylons would want to hit when attacking the camp would be the vipers on the ground, but they don't. This allows the human pilots to take to the air and eventually rout the Cylon attack. In a rare moment, at 36:33 on the DVD, Rigel has let her down! Omega says the Galactica's sensors detect a galaxy beyond the pulsing star they've found in the void. "Your dog had an "accident" in my sleep bay!" "But that's impossible! Moxie is a robot!" "I know! I found a big, smelly pile of nuts and bolts on my blanket!" I even found a copy of the parody online. Pages 111-end cover the events of "A Death in the Family"
After his capture, on pages 125-127 Starbuck is interrogated by Lucifer before being taken to Baltar. It's a rather friendly interrogation though. Lucifer seems to like the maverick pilot. Page 135 reveals that Serina's bridesmaids were Athena, Cassiopeia, Dietra, Brie, Gemi, and Rigel. On pages 138-140, Lucifer plays a game of pyramid with Starbuck...and loses, of course, even though his computer brain should be able to beat any human. They bet Cylon coins! Who knew the Cylons used money still? On page 146, Adama remarks that the 12 worlds of the Colonies are in a trinary star system. On page 151, Starbuck comments, in regards to his card play, that "devious is my middle name". While "...is my middle name..." is a common euphemism for us on Earth, what use would a society that seems to have only single names for individuals have for the term "middle name"? (However, the Sagitaran inhabitants of Maytoria in "Behind Enemy Lines" seem to have at least dual names, if not triple ones.) 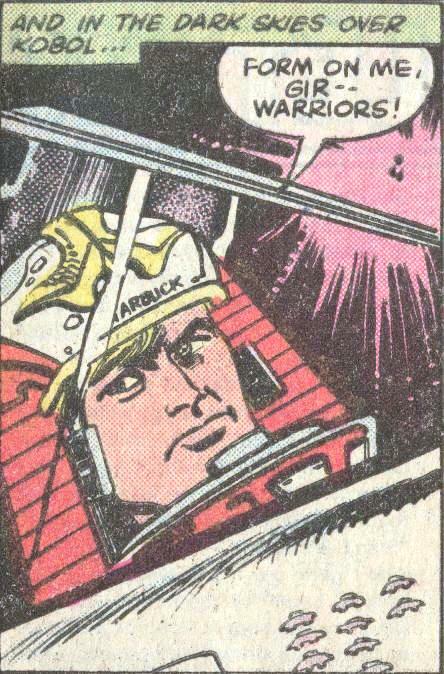 Starbuck's next statement turns his comment into a mild joke, "Star-devious-buck." Page 167 suggests that, while the Kobolians were polytheistic at one point, they gradually grew towards monotheism as the planet's tribes united, with the previous gods considered lesser deities. Serina and Adama seem to imply as well that the Colonies were generally monotheistic. This goes a long way to explaining the show's (and particularly Adama's) differing use of "gods" or "God" at different times. Page 175 reveals that Lucifer chose to attack the humans on Kobol despite Baltar's orders because he wanted to act impulsively the way Starbuck told him most of his heroic feats had been achieved. Page 193 suggests that the cadets' inexperience was actually an advantage during the Cylon attack on Kobol, the pilots erratic flying confusing the Cylons. If you look and listen closely at 37:25 on the DVD of the episode, you will notice that the viper destroyed at this point was Gemi's (corresponding to her death on page 193). On page 197, Starbuck reflects that Athena just "saved his bacon". Another Earth phrase used by a Colonial. On page 202, Starbuck refers to centurions as "red lights". In the epilog of the book, Lucifer rescues Baltar from his entrapment in the tomb. An alternate version of Lucifer's rescue of Baltar also takes place in issue #7 of Marvel's BSG comic book, "The Memory Machine". In the TV series we don't get an explanation of how he made it back to his basestar. Notes from the comic book adaptation of "A Death in the Family"
In this issue, the character of Dr. Salik is instead called Dr. Spang. Possibly the doctor had not yet been given a name in the early script from which this issue was adapted and writer McKenzie thus chose to give him the name Spang. Note that Spang is the last name of the actress who portrays Cassiopeia, the doctor's new assistant (Laurette Spang)! For some reason, Baltar appears to be wearing a shirt with the image of a partially eclipsed planet or sun on the chest in panel 2 of page 15. But the shirt does not appear the same anywhere else in the story. On page 17, panel 3, Adama appears to have been given Baltar's dialog. On page 27, panel 1, Starbuck's viper has a tally of the number of Cylon raiders he's destroyed painted just below the cockpit canopy. On page 30, Starbuck regretfully says that the two centurions who shot and killed Serina were the ones who brought him to Kobol to be returned.